Weighing 70 to 75 grams and being about 7 mm thick, the Katana is a rigid, relatively fast combination blade with forehand and backhand sides that possess distinctly different characteristics. 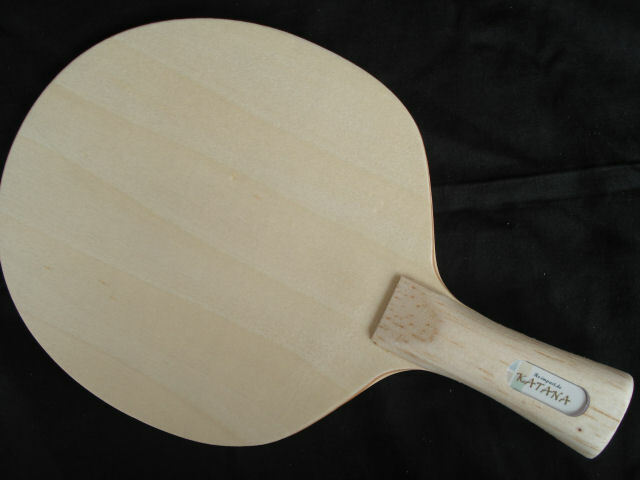 The blade’s forehand doesn’t contain balsa, providing high control, high spin, and high speed. 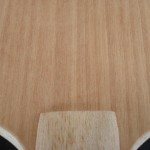 On the slower backhand the hard, thin outer ply offers good reversal; the combination with the relatively thick balsa ply provides a distinctive dampening effect and high control. 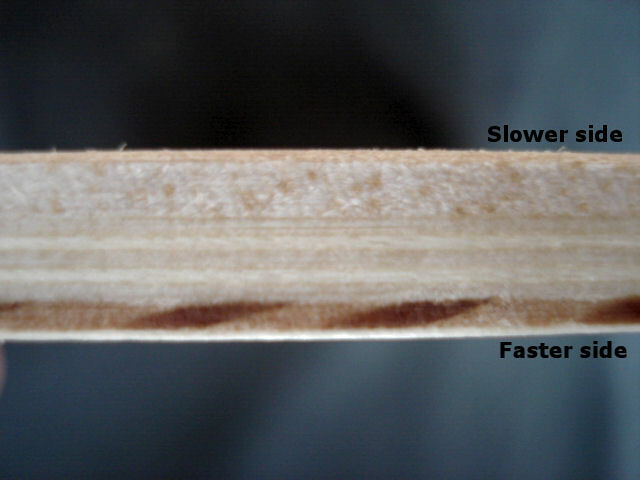 The typical balsa catapult is noticeable in the backhand and will, on hard contact, result in somewhat higher speed and less control. The blade is quite low-throw on the backhand side, but higher throw on its forehand. 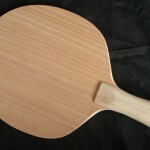 The Katana is designed for aggressive backhand defense using long pips-out rubber combined with fast forehand topspin attack close to the table, though not exclusively. Its overall speed level is medium to high, which makes it less appropriate for classic defense away from the table, but it will sustain backhand chopping combined with mid-distance loop-attack. Blocker-hitters will also be able to use this blade effectively. The Katana’s forehand combines especially well with any type of inverted rubber, but also with short or medium pips-out rubbers. Fast rubbers will add to the difference between forehand and backhand. 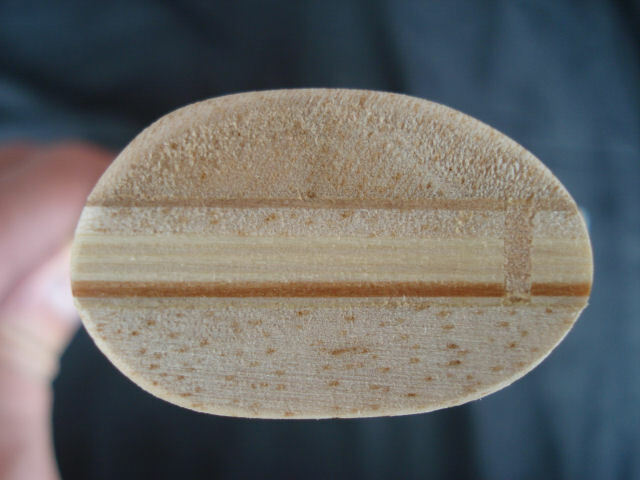 As there is no balsa-effect in this blade’s forehand, even max thick rubbers can be used, but max thick soft sponges will tend to produce a squashy feeling and less feedback. 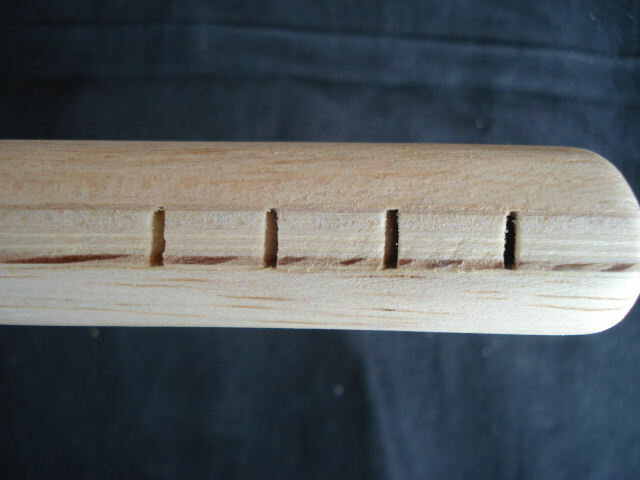 As the forehand plies offer qualities consistent with high-spin-high-speed looping, short or medium pips-out rubbers should be fast and have relatively thin sponge (1.5 to 1.8 mm) if classic pips-out effects are required. If, however, the player’s main needs are only speed and relative insensitivity to incoming speed, thicker sponge can be used as well. 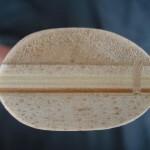 For looper-attackers, fast inverted rubbers of the modern Chinese type (medium to hard sponge and tacky top-sheet) are very suitable for the Katana’s forehand, as are Japanese and European type tensioned and tuned rubbers with medium to hard sponge, in any thickness required, but best 1.8 mm or thicker. For choppers, inverted rubbers on thinner sponges of medium to soft hardness would do best. Chopper-attackers can use their preferred compromise on this blade. 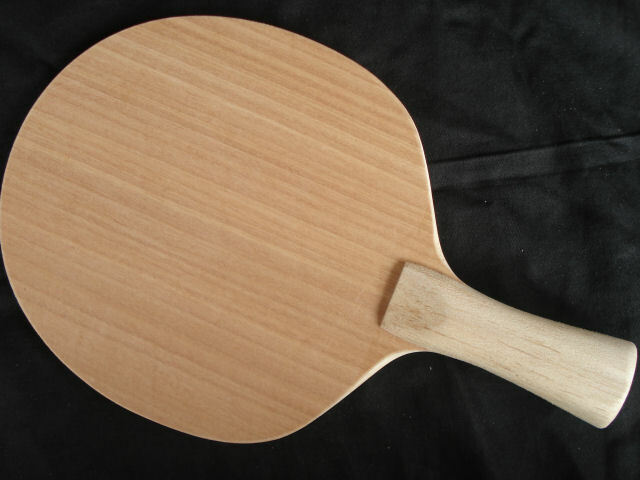 The Katana’s low-throw, medium slow and controlled backhand combines ideally with almost every well-reversing long pips-out rubber without sponge, if used for close to the table defense. 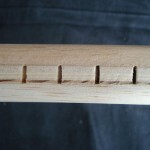 Long pips-out rubbers with sponge and/or more friction can be used for more aggressive play at the table, and also for defense away from the table; control is, however, slightly lower with these rubbers. 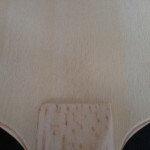 Short or medium pips-out rubbers as well as inverted rubbers on thin sponge can also be used for blocking and chopping on the Katana’s backhand. 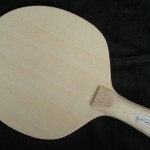 The use of anti-topspin rubbers on this blade would be a matter of personal preference; as a rule, blades with balsa in significant thickness are less well suited to anti-spin rubbers. Almost all Re-Impact blades, having been designed for specific purposes, have special properties which are beneficial to the desired style of play, but in some situations may pose unexpected problems. 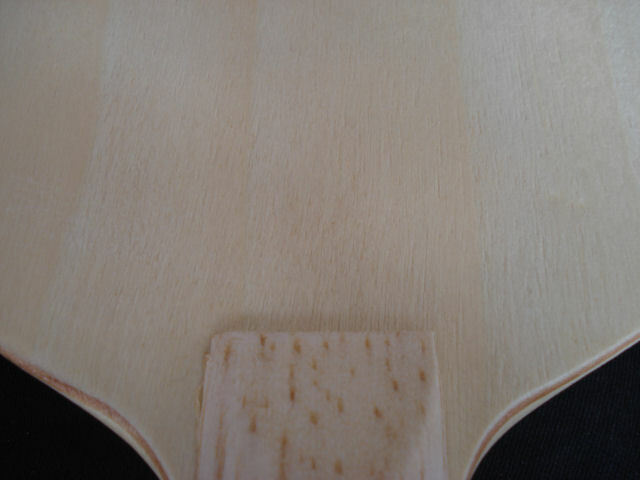 The balsa ply in the Katana’s backhand will absorb speed on soft to medium hard contact with the ball, but if contact is much harder (incoming fast loops or smashes) it will become faster and hence less controlled. Fast incoming balls should, therefore, either be softly blocked, or actively blocked or chopped. Slow loops having a lot of spin, which are difficult to handle with most set-ups using OX LP’s, may also be hard to deal with using the Katana. The ball, being slow and thus contacting the blade rather softly, will lose even more of its speed because of the braking effect of the balsa; added to its high spin, this will result in much higher friction (for a long pimple) if a passive block is attempted, and as a result the ball will tend to be returned too high. As an alternative to blocking, these balls can be safely chopped or chop-blocked aggressively, moving one step away from the table. The blade is sealed; extra sealing is not really required. It won’t do any harm to add some extra protection on the blade’s face, but adding more than two thin layers is inadvisable, as it will harden the feel of the blade. 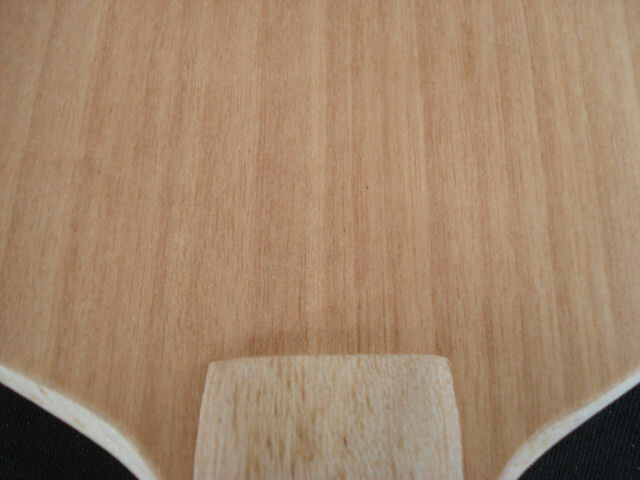 Balsa is very vulnerable and since it is exposed on the edges, it makes sense to protect the edge of the blade. A coating will help some, but better still is thick (or foamed) edge-tape. 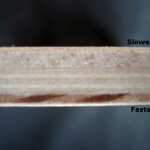 Protection of the soft balsa grip using sealing or tape is not advisable, as the blade’s KSLS-system should be in optimal contact with the hand. Below are some pictures of this blade. Click on the image to see the full size version.